The Modern Home featured in the 2016 Professional Builders Show Village at the National Association of Home Builders International Builders Show in Las Vegas, opening January 19 is a modular home built by Palm Harbor Homes in collaboration with strong design and development partners. The stunning, three-story 1,950 square foot home is located in the popular show village in the Las Vegas Convention Center parking lot and is open to all attendees. More than 10,000 people are expected to tour the home. Chris Krager, AIA/KRDB, answers questions about building with modular at the National Association of Home Builders’ International Builder Show in Las Vegas, January 2016. Designed by award-winning architect Chris Krager, Principle of KRDB/MA of Austin, TX, the energy-efficient and sustainable modern modular home features a large open floor plan with floor-to-ceiling windows, offering stellar downtown views, high end finishes throughout and even offers a private roof-top space. 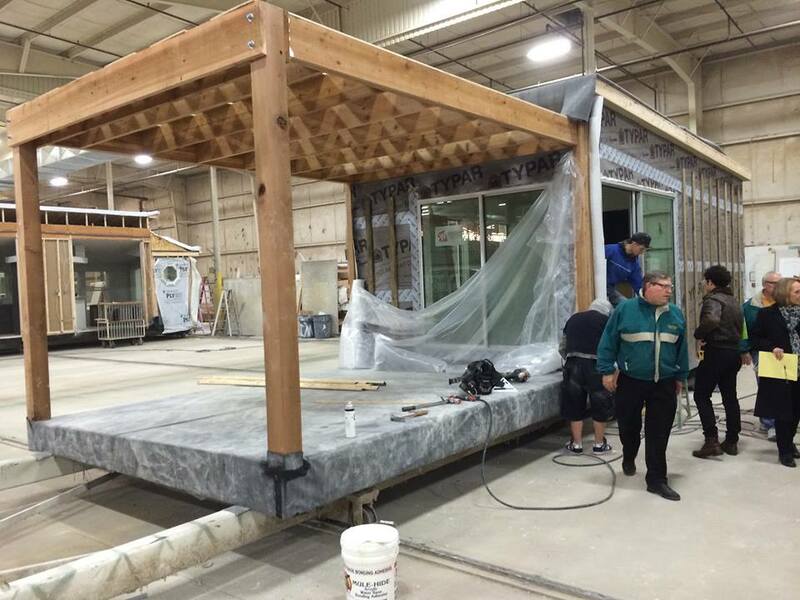 The 5 modules for the IBS 2016 NAHB show were originally constructed in environmentally protected building centers. The home was originally built in the Palm Harbor Homes building center outside of Portland, Oregon, and was transported in 5 sections or modules to Las Vegas. Once it arrived at the show, it was assembled on site with a crane and finished out by company-trained set crews. Featured throughout the home are state-of-art products from many of the vendors at the show such as Western Windows, Simpsons Doors, Jenn Air, James Hardie, Geberit and Sherwin Williams, among many others. Chris Krager, AIA/KRDB, the architect for the home, and Noah Ornstein, co-founder and CEO of Ark.la, on the rooftop entertainment space of the Modern House at IBS 2017. “We are extremely honored to be able to showcase our contemporary modular home that offers top-of-the-line technology and eco-friendly, energy-efficient features to home buyers who care about design and green development,” said Noah Ornstein, co-founder and CEO of Ark.la. Ark.la is the home building division of Leap Of Faith Partners (LOF), a Los Angeles-based investment group. 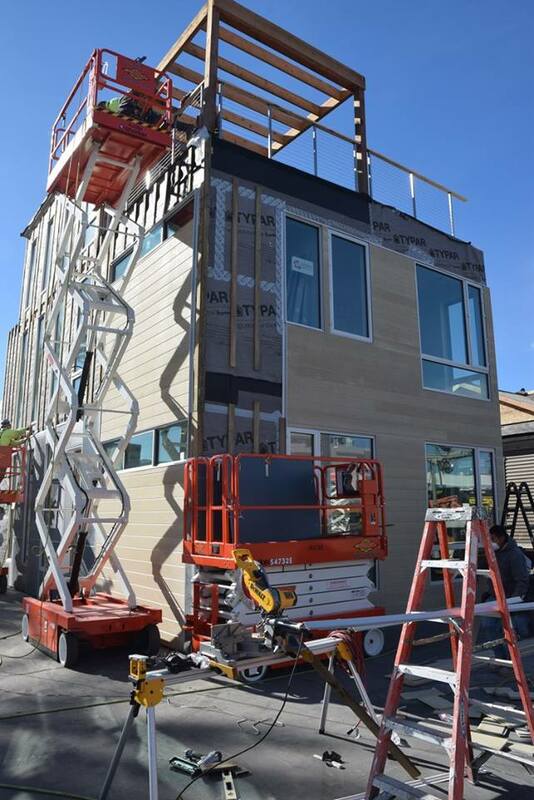 Exterior finish out on the modular 4-story home after delivery to IBS 2016. After the show, the home will be returned to its original 5 modules and will be relocated to Los Angeles. 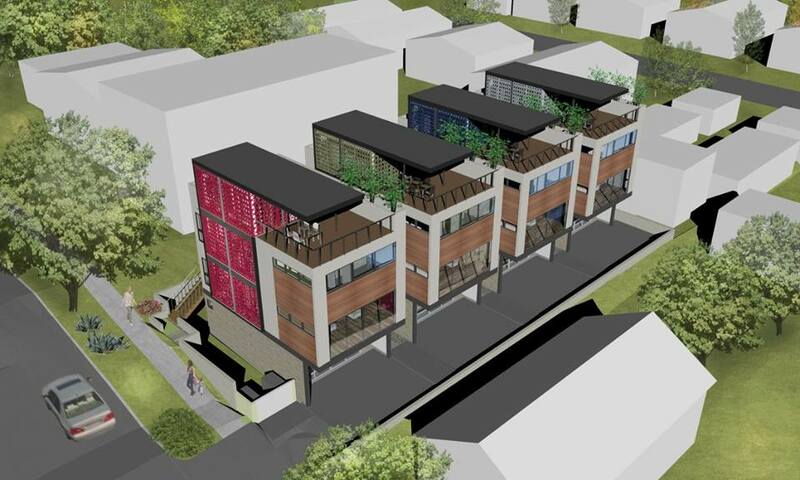 There it will become part of a 4-home modular green project to be located on Quintero Street in Echo Park. This residential small lot subdivision was developed by Ark.la. It is expected to be available in the spring of 2016. Each of the 4-story modular homes is built to qualify for the NAHB Emerald Environmental Rating.